Ilyashev & Partners Law Firm has offered a gratuitous financial assistance to the Taras Shevchenko National University of Kyiv, so that the educational process of the Law Faculty would not stop. “There are dozens of specialists working for our company who consider Taras Shevchenko National University of Kyiv their alma mater. We could not stand back having discovered that the students of the Law Faculty of the National University were made to take distance learning because of the low temperatures in the University lecture halls. We are ready to partly cover the university’s operating costs for heating, so that the law students continue their on-campus, rather than remote studies, and encourage other leading companies to support our initiative, – said Mikhail Ilyashev, the Managing Partner of Ilyashev & Partners Law Firm. – This year we are also willing to allocate funds for the implementation of energy-saving program to improve the heat supply of the University premises, so that the temperature in the building is sufficient for comfortable learning and to ensure that such situations will never arise again”. The media previously reported that the University students were made to take distance learning until February 28, 2018 because of the problems with the payment for utility services which the higher educational institution encountered. 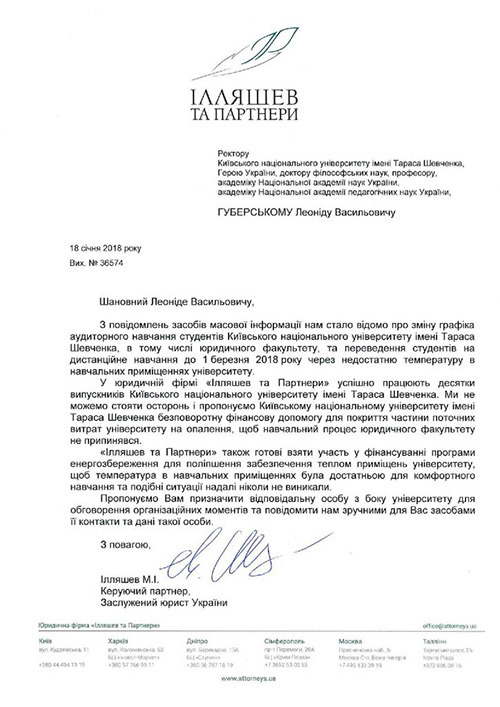 Later on Taras Shevchenko National University of Kyiv denied the information about the unpaid heating costs and stated that the amendments to the academic curriculum were approved by the University Administration at the request of the Student Parliament to reduce the period spent by the students in the academic buildings in cold winter season when forming the academic calendar for 2017/2018. According to The World University Rankings 2018 Taras Shevchenko National University of Kyiv is the best Ukrainian university and is included into the list of the TOP-1000 universities of the world. Founded in 1834, it is one of the oldest and largest educational institutions in Ukraine. The Law Faculty of the University was opened in 1835. The “Red Building” of Taras Shevchenko National University of Kyiv, which houses the Law Faculty, was built in 1837-1843 and is a symbol of Ukrainian fundamental university education.